I attended the Marshall County Crossroads meeting today. Swan Lake Resort hosted the event. It appears the steering committee is making good progress and I commend Ginny Munroe and Kevin Overmyer for taking this on. It is a daunting job. The Stellar Community effort in Culver was difficult on a single community level, so I can see that upping the community count to 6, plus the county, has to increased the difficulty in a geometric progression. I’m not sure if many of the new ideas generated today will be usable in the application since we’re getting down the the wire, but I am sure some of them can be melded into the existing targeted goals. It was a useful effort. Culling out some of the other, stand alone, good ideas can be added to the overall planning for the future. 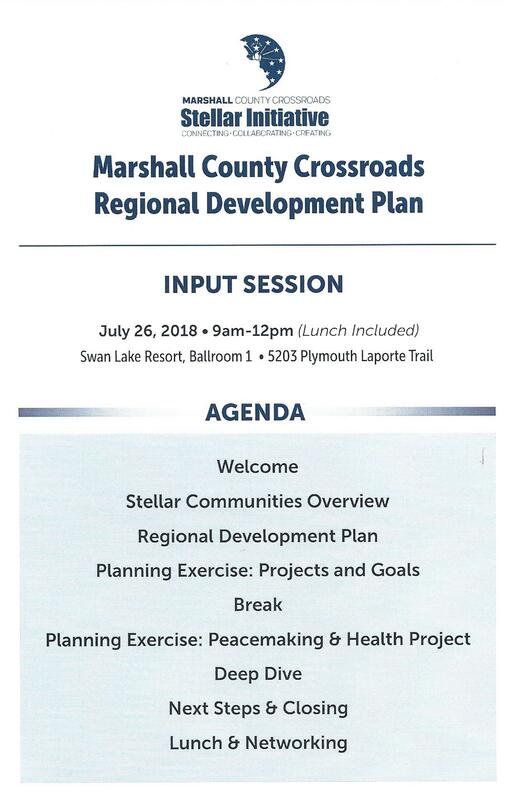 I would sincerely hope that some of the overarching organizations such as the Marshall County Community Foundation (MCCF) and the Marshall County Economic Development Corp. (MCEDC) will include them in their planning and that the individual communities and the county will fold them into their individual strategic action plans. Possibly Marshall County Crossroads morphs into its own continuing entity to spearhead these things. 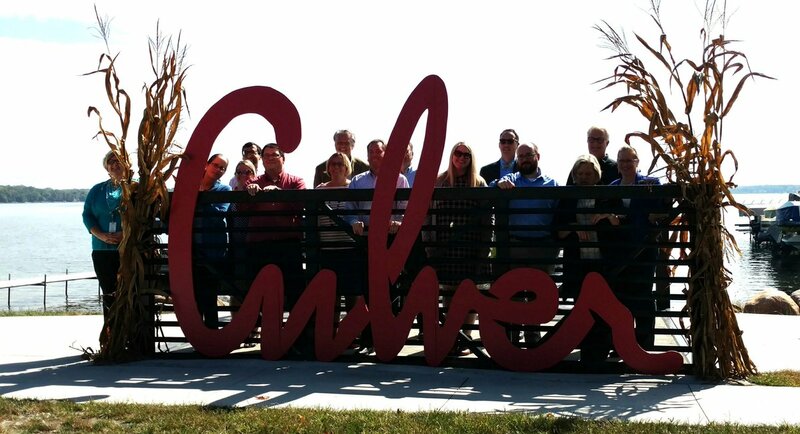 The planning and collaboration process was one of the more important “wins” to come from the Culver Stellar application. Keeping that supportive collaboration going can be like herding cats, but it’s worth the effort. I think Marshall County Crossroads is a good next step in the mutual support that has been fostered by MCEDC’s County Development for the Future program. We’re better when we can work on goals together. 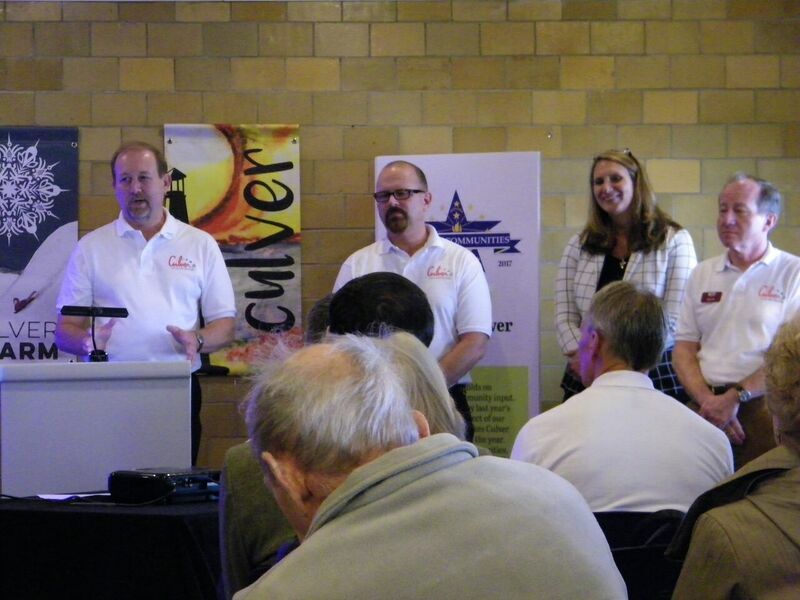 From Left to Right, Bob Porter – Culver Utilities Superintendent, Jack Jordan – State Representative, Dale Cramer – Lake City Bank, Joel Samuelson – Culver Town Council, Kevin Berger – Easterday Construction Co., Inc., Tammy Shaffer – Culver Town Council, Ginny Munroe – Culver Town Council President. 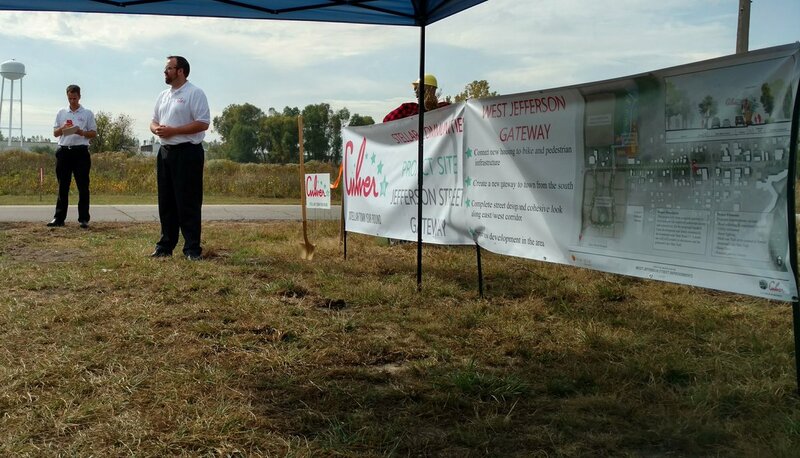 I was pretty impressed with the turn out for the Sand Hill Farm Ground Breaking Ceremony last Tuesday, November 5th. There were around 35 people there including representatives from the Town, County and State. 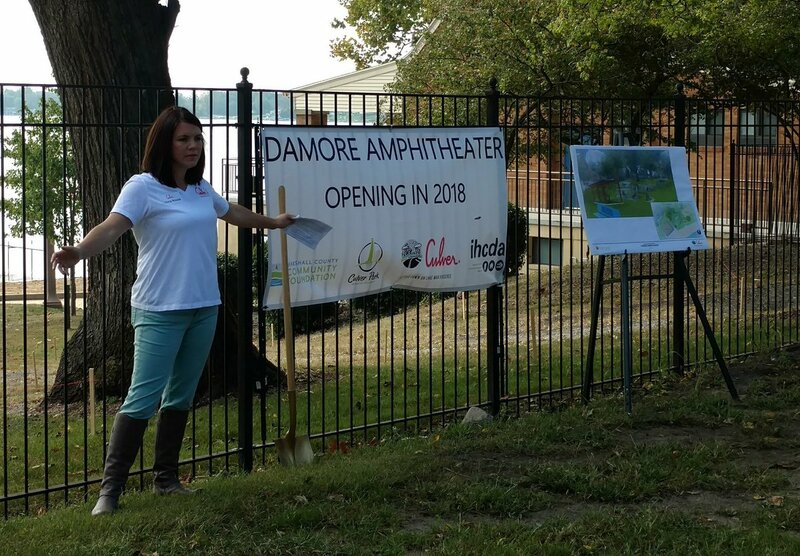 Town Council President – Ginny Munroe, County Commissioner – Kevin Overmyer and Lake City Bank Representative – Dale Cramer all spoke in support of the project. I truly appreciated the kudos. We broke out the gold shovels and made a showing of it for the Press. The theme from everyone was how this was a first step towards addressing Culver and Marshall County’s workforce housing needs. Currently, Marshall County has an unemployment rate of less than 3%. The general “rule” is that once it gets below 4%, everyone that wants to work is working. Since there are still jobs going unfilled, the next step would be to recruit labor from outside the County. That’s difficult when there isn’t housing available for those new workers. Sand Hill Farm hopes to be a first step towards addressing this. This is Easterday Construction being a community partner/leader. Along with the several of our area newspapers, we received coverage from the three major networks, ABC 57, WNDU 16 and WSBT 22. 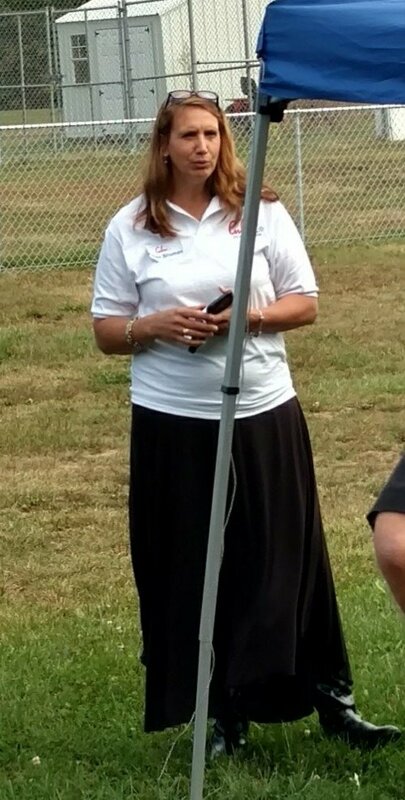 See WSBT links for video clips of the Stellerbration event and ABC 57 and WNDU 16 for a little more about the Sand Hill Farm ground breaking. They were all kind with their video editing and made us look good! Housing was the signature piece of Culver’s Stellar Communities application and I truly think we wouldn’t have scored as highly without the Phase I portion of this project underway. 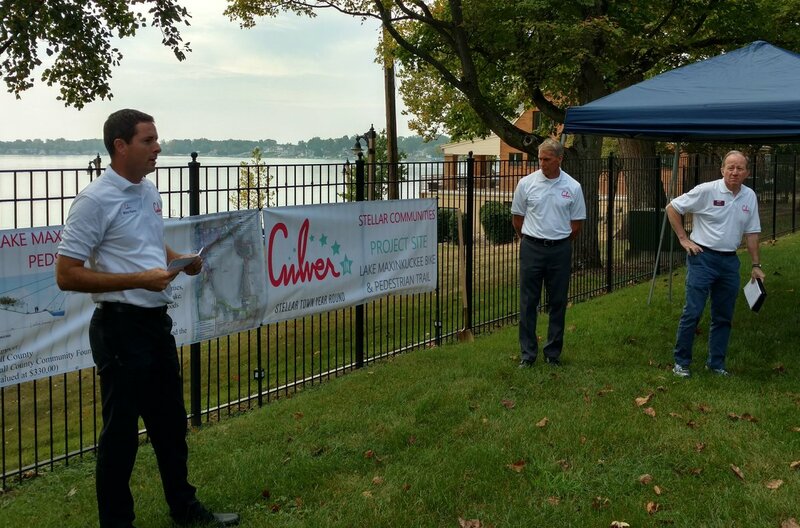 It showed that even without winning Stellar designation last year, Culver moved forward, addressing the needs identified in our Strategic Investment Plan. Having Regional Cities also put money towards this project was positive too. It showed a regional commitment that the State values. 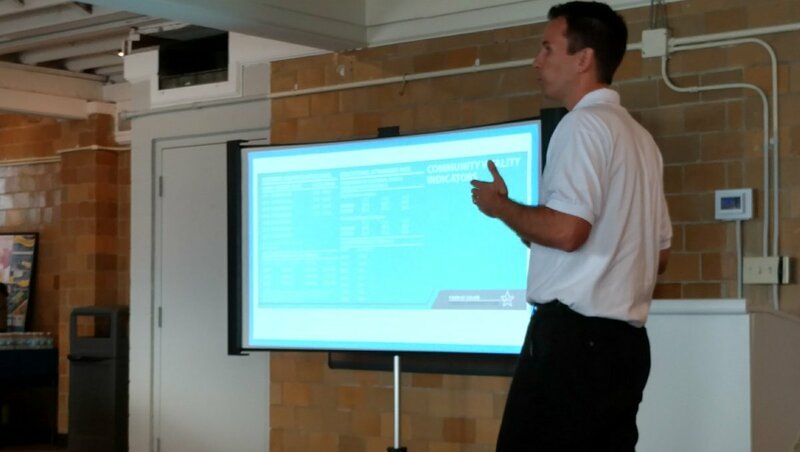 At several of the presentations, I was pleased to stand with Culver’s three largest employers, Elkay Wood Products, Culver Community School Corporation and Culver Academies, as their representatives spoke about the needs this project was addressing and how this needs to be just the start. 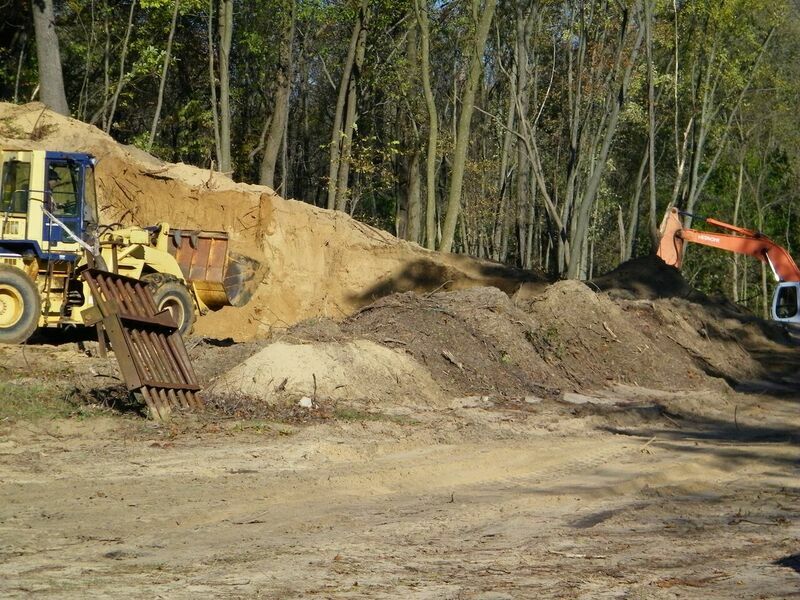 Excavation underway at Sand Hill Farm. Some of the hill is going into the building pad. 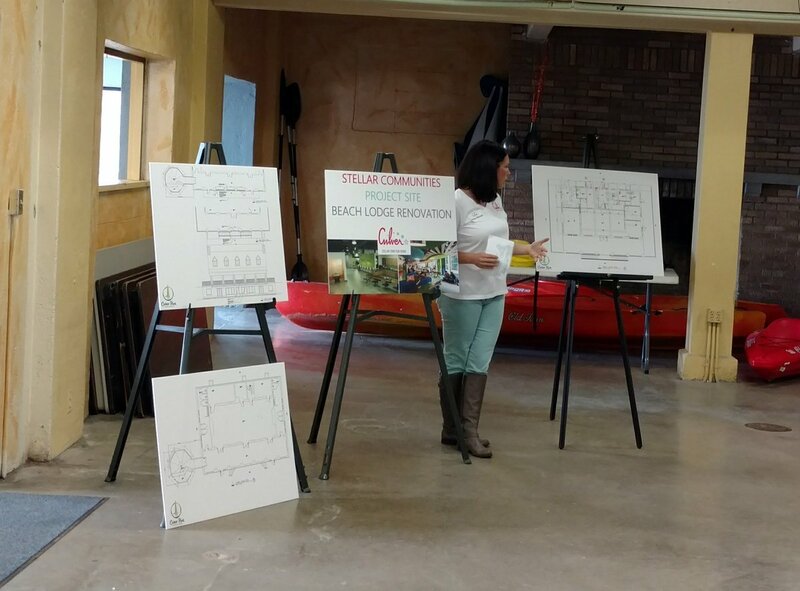 Tuesday was a true ground breaking as we made our presentations with an excavator working in the background. Currently the building pad is nearly complete and the excavator should be cutting in footings in the next week. the site looks quite different. We’re racing the weather to get the slab done so we can work through the winter. Since it is slab-on-grade construction, that means a fair amount of underground utility work needs to be completed as well. Cross your fingers for us! It sounds like the Town will delay their street work until Spring. That shouldn’t affect us as long as they are complete sometime in June. The goal is to be open next summer before the new school year starts. That would meet many of our goals, i.e. increased Town population, increased school enrollment and an expanded labor pool. Thanks to Nancy Tyree at MCEDC for the pictures. 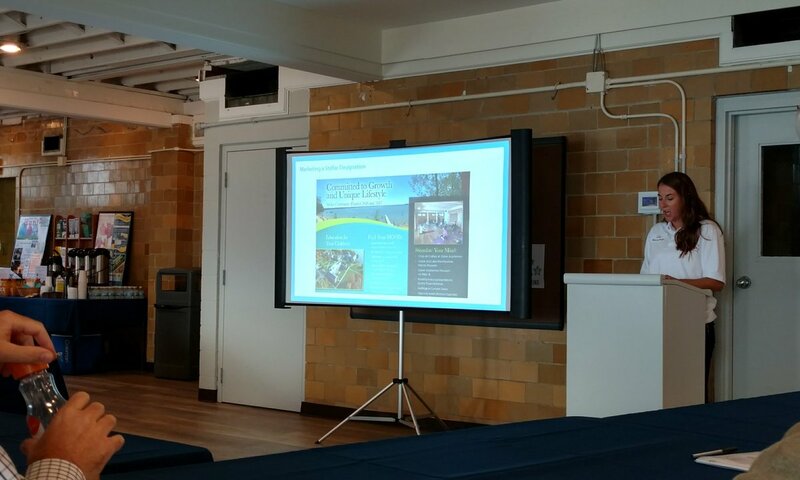 Last Friday was my last day as a Lake Maxinkuckee Environmental Fund (LMEF) board member. I decided 20 years was enough. 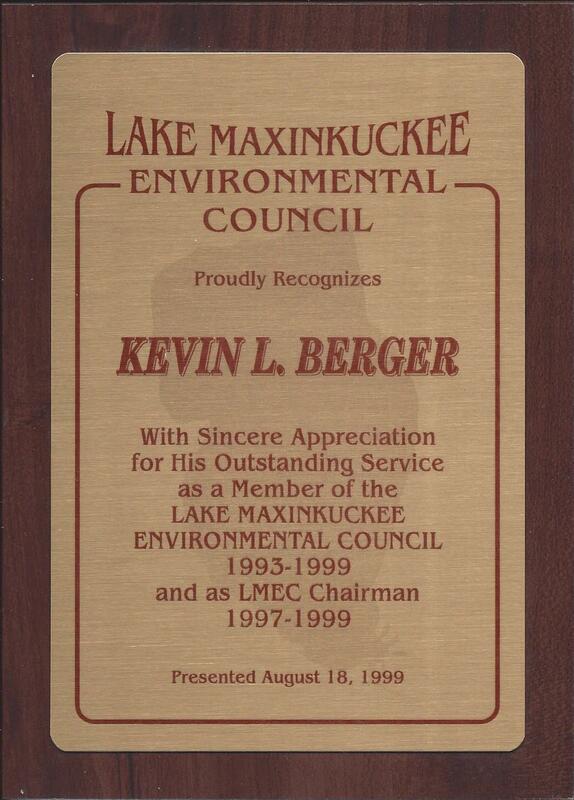 I joined the Lake Maxinkuckee Environmental Council (LMEC) in 1993 and served two 3 year terms. The last two +/- years on the Council, I was Council Chairman, which automatically put me on the Fund. When my Council term ended, I was asked to continue as a Fund board member, which I did. To the best of my knowledge, I served the organizations longer than anyone else, though Tom Sams may be in the running. I’ve been there to work with all three directors, Karen Dehne, Tina Hissong and Kathy Clark. The three large wetland construction projects were mostly complete when I joined, but I was there through most of the other major projects. I lead the beginning of the renovations to the outlet control structure as Council Chair and then saw it though as a Fund board member. I can walk away proud of my influence on the direction of the organization. I’ve told them that I would be available for consultation as needed, but I’m sure it will be a different board going forward. I believe they benefited from the historical context I could give, but I’m also sure they will find their way without me. My tenure length was more the doing of others than myself. I was not interested in taking a leadership position, so I had offered to step down and allow someone with an interest in leadership to step up several times in the past. Past Presidents at those junctures asked me to stay on. I felt I still could contribute on that basis, so I remained. Every board should have a Devil’s Advocate and I often found myself in that position. My sense of history often propelled that. Personally I think that’s more valuable that just saying yes to be agreeable. 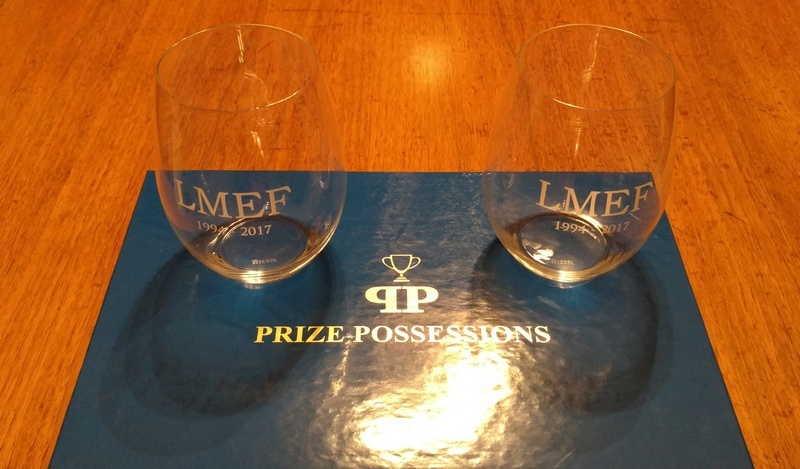 I hope someone new fills that need for LMEF going forward. Best wishes to the organization going forward. I hope they are true to the mission set forth by the founders four decades ago.